600 million African people are living without access to mains electricity. This shocking statistic is being addressed through the partnership between Azuri Technologies and Lendahand Ethex, by enabling people in the UK to invest in the installation of life-changing solar technology. The Energise Africa initiative allows households in rural areas of Africa to leap-frog over the traditional grid and obtain access to modern devices powered by clean and affordable energy. 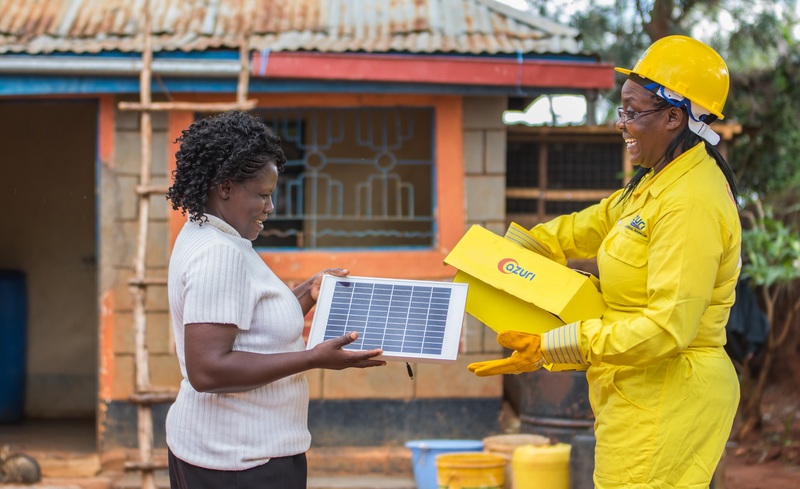 With the advent of pay-as-you-go technology, consumers can access solar energy - which is a safer and more affordable alternative to the traditional kerosene lanterns. It also allows them to charge small gadgets such as radios and mobile phones, keeping them in touch with family, friends and the outside world. Pioneering businesses like Azuri can supply pay-as-you-go solar technology to rural African villages where grid electricity cannot reach. However, they require commercial debt finance to build the solar equipment in the first place. The partnership between Azuri and Energise Africa enables retail investors to support the transformation of Africa and at the same time, make a potential return of 5% per annum on their investment. Over the last 9 months, £1.7M has been raised to deliver power to some 16,000 households, and the rate of investment is growing. Energise Africa provides information on a range of possible solar projects available for investment and allows people to keep an eye on the performance of their funds. This makes it simpler for new and experienced investors alike to start investing in a sector that can deliver a social, environmental, and financial return to both themselves and the end consumer. With a minimum investment of just £50, it is an accessible way to try investing for impact. The finance raised enables Azuri to supply PayGo solar home systems to off-grid households in Africa on a commercial basis. The cost of the solar home system is less than the cost of the kerosene lamps and mobile phone charging fees that it replaces and provides clean, reliable light and power for phones at the touch of a button. It also has the added benefit of providing light longer into the dark evenings allowing children to study for longer and families to socialise. One user, Alice who lives in Vota, Kenya purchased an Azuri Quad Solar Home System which provides light, phone charging, a portable radio and a torch. She commented “The kerosene lamps were so dim and made the children cough. Now we have solar power, both of my sons can study safely in the evening and their grades have dramatically improved. Now that I have solar, I would never want to go back to kerosene”. Simon Bransfield-Garth, CEO of Azuri Technologies said: “We are delighted to be associated with Energise Africa and work with the crowd to fund off-grid solar projects. Innovative financing is ensuring that we can solve the problem of energy access in sub-Saharan Africa. Danny den Hartog, Managing Director of Lendahand Ethex said: “Through Energise Africa, Lendahand Ethex is committed to providing UK based investors with easily accessible opportunities to invest directly in sustainable businesses that can create long-term social and environmental impact, whilst also delivering a potential financial return. By working with mission-driven organisations like Azuri Technologies we can significantly scale the power of the individual investor to bring affordable solar energy to thousands of people across Africa – transforming lives”.